Sara McFall was dismayed when she developed severe eczema as a teenager. She kept the rashes at bay using steroid creams such as Elocon. Unfortunately, as the years passed, her skin stopped responding to the cream as well. Sara tried to go on a gluten-free diet and stopped using the cream altogether. Her face broke out into a horrible rash around her eyes and mouth. She felt hopeless. Her cream no longer worked, and her skin was actually experiencing withdrawals from not using the medication. Her new rashes were caused Perioral Dermatitis, which is triggered by overuse of steroid creams. Sara eventually began seeing a naturopath and created her own remedy for her face. Her rashes eventually went away, and she attributes it to the natural ingredients she used. What did she use for her main cure? Apple cider vinegar is the answer. Sara applied unpasteurized apple cider vinegar diluted with water to her face three times a day. She noticed that her rash went away within six weeks. 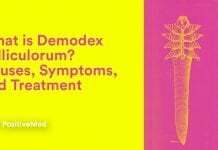 This may seem like a long time, but most people with Perioral Dermatitis experience symptoms for up to a year. Sara also used tea tree and lavender oils on her face, stopped wearing makeup, and did not wash her face in order to let her the natural oils on her face cleanse away the irritation. Why did apple cider vinegar cure Sara’s skin conditions? The answer lies in apple cider vinegar’s healing properties. The liquid contains lactic, malic, and acetic acids. These acids are both antibacterial and anti-fungal. These acids also soothe inflammation. The beta-carotene in vinegar encourages cell renewal. Sulfur not only gives vinegar its sharp taste and small, but it serves as a powerful topical antibiotic as well. Vinegar flushes out the toxins that can cause mild, moderate or even severe eczema flare-ups. Vinegar can also help your skin overall, even if you don’t have eczema. Vinegar can kill the bacteria that causes acne, and it can also lighten the appearance of scars and age spots. It may even reduce the look of fine lines and wrinkles. To make an astringent or face treatment out of apple cider vinegar, simply mix vinegar and water. Make a 50/50 mix so that the vinegar does not irritate your skin. It is recommended that you try the mixture on a small patch of skin on your arm or hand first to rule out an allergic reaction. Once you are certain that the mixture will not irritate your skin further, spread it onto your face with a clean cotton ball up to three times each day. RELATED ARTICLE:THIS WOMAN PUT HER HANDS IN APPLE CIDER VINEGAR TWICE A WEEK; THE RESULT IS AMAZING! If you suffer from eczema all over your body, you may want to take an apple cider vinegar bath. To do this, you can add half a cup of apple cider vinegar to your bath water, then soak in the tub for up to 15 minutes. The many vitamins in apple cider vinegar strengthen the immune system, so drinking it certainly won’t hurt if you’re looking to be healthier overall. The potassium found in vinegar can even reduce allergy symptoms. To make an apple cider vinegar drink, add two teaspoons of it into an 8 ounce glass of water. 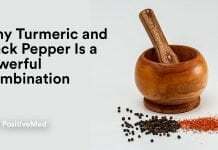 Make sure that you mix it with water so that you do not cause yourself any stomach upset. You can add honey or baking soda to your drink for maximum benefits. Apple cider vinegar certainly helped Sara’s skin problems, and it has been proven to be beneficial for many other people suffering from skin maladies. However, you should check with a healthcare professional before changing your diet or drastically altering your skincare routine to make sure that apple cider vinegar will not interact with any other medications you are taking. 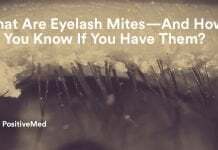 What Are Eyelash Mites—And How Do You Know If You Have Them?